Since I’m still new to XPages, I’m always finding things that are a challenge. Most of the time, I don’t know how big a challenge they are because doing things in XPages isn’t the same as doing them in Old Notes. On the payment request in our procurement module, the user needs to enter the exchange rate between the local currency and the base currency for approval routing. Sometimes, the payment has already been made in local currency while the exchange rate has changed. They might only know the amounts in the two currencies, but didn’t record the exchange rate at the time. In discussions, I suggested that it might not be difficult to simply have a popup that allowed the user to enter the amounts and return the value to the payment request in the UI. Surprisingly to me, I was right. It’s not that hard. My challenge was that I decide to put this exchange rate computer into a custom control so that I’d be able to re-use it. That meant having to figure out how to have the dialog do a partial refresh on the payment request, in order to recompute the total amount in the base currency (USD). Each of those line items displayed in the payment request is a separate Notes document, so, in Old Notes terms, this would be like an embedded view, but since we’re in XPages, it’s a repeat. (I am learning to love repeats!) 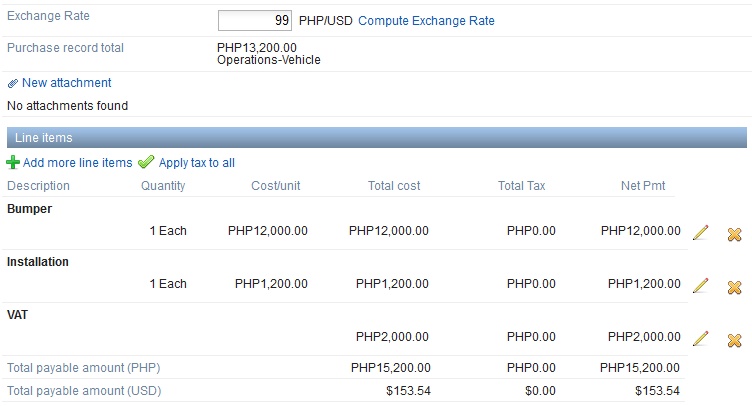 The total payable amounts are ‘computed fields’ in XPages, which is like a computed for display field in Old Notes. As such, they wouldn’t actually save anything to the payment request document. So, we have some non-displayed computed fields with some server-side Javsacript (SSJS) that aggregates all the local amounts from those view entries and puts it into the control on the XPage. As such, when the exchange rate changes, there is a partial refresh. So, on our exchange rate control, we had a partial refresh for onchange. Simple control, bound to a field on our payment request document. So, I created my exchangeRateComputer custom control. I decided to make the link part of the custom control so that implementing it on any other XPage would require the least work possible. I decided to always set the control on the XPage to be named “exchangeRate”, so I don’t have to pass a string with the control name. As an added bonus, I wanted to fill out the local currency field for the user and just let them enter the final base currency amount they’d like to see. <xp:link escape="true" text="Compute Exchange Rate" id="computeLink"
<xp:button value="Apply to payment request"
The last tweak to it is that my computed exchange rate in the dialog is just a computed field. I struggled a little until a dogpile search revealed that I needed to get that value as innerHTML. If you try getValue() on a computed field, you get bupkis, but if you grab the innerHTML, you’ve got the world in your hands. It feels like that would be easier in Old Notes, but I hardly care any more. I have a new micro-solution in my toolbox and I expect to re-use this not only for other exchange rate computations, but to re-use the dialog and value-passing in many places. It’s all about building up your toolkit, right? One of the bigger hurdles in design and usability for me when making the transition from standard Notes to XPages is, how do you make hide-whens that work like they do in standard Notes? My first attempts, as I am sure everyone’s were, was to think of the ‘visible’ property on the properties of a control as the same thing as a hide-when formula in standard Notes. It’s not. This become more obvious when you see that in source. In source, when you deselect “Visible”, your control gets a property of rendered=false. So, in XPages, if your formula (or simple checkbox) calculates to false, the item is not even rendered. That is, it’s not part of the page, so if values change it doesn’t matter. The formula is not on the rendered XPage to be recomputed. As an old-school standard Notes developer you would expect it to be hidden, but computed and displayed when values change. Fortunately, there are ways to code controls so that they do act like our standard Notes hide-when formulas. By using CSS styles, we can have controls exist on the XPage that do not display. By manipulating the style, we can control whether a control appears or not. Now, just as in standard Notes, in which you needed to make the field which controlled the hide-when forced refreshes when it changed, you also need to do the same thing in XPages. However, the good thing about XPages is that you can do it via a partial refresh, refreshing only the control you want. Fewer round-trips to the server for less data makes for a far more responsive application. The best thing is that you can add an onchange event handler to any field with a simple line of code, identifying which control you want to refresh. Note that I’m refreshing a panel with my partial refresh — I put the label and the field into the panel so that both are managed by my display style ‘hide-when’. Even more interesting is when the hide-when is based on a check box group in which one value (“Other” in many cases) determines whether an additional field is displayed. In standard Notes, this would be handled by a simple @Contains, but it’s a little more complex in XPages. Multi-value fields that contain multiples are Vectors, but multi-value fields that contain a single value are simply string variables. It helps when working through these things to check the actual values returned, since, as you see above, sometimes the string returned is not what you think it would be. I’d assumed it would return “Other” in both cases, but when a part of the Vector, it returned a string, and when a string returned the string encased in brackets “[Other]”. Astute observers will wonder why I’m using getComponent in one and getItemValueString in the other up above. I have to turn to the experts and scratch my head here. I know that each works in the instance I’m using it in and I think that getComponent would work in either, but I’m not sure. 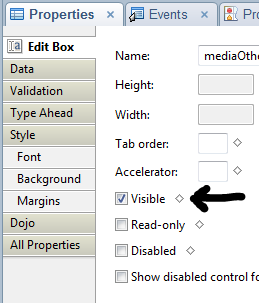 I do wish that IBM would rename the “visible” property to “rendered”, so it is less confusing to the newly minted XPage developer, but it would be problematic to both change that and add a new property named “visible” for using block vs none display style, since it would also confuse everyone.